Nico Morgan Media | Parade of the Badsworth and Bramham Moor hounds, Bramham Horse Trials 2013. 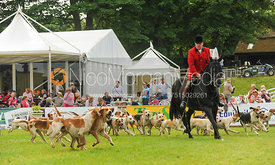 Parade of the Badsworth and Bramham Moor hounds, Bramham Horse Trials 2013. Bramham House, Yorkshire. The Badsworth and Bramham Moor Hunt parade their hounds on the last day of Bramham International Horse Trials, June 2013.